Here I am in the sixth grade. I didn't like the way I looked then. So yesterday I sent this picture to my sisters and some friends, and they all said that I was cute. Yes, I'll buy that now. But it sure brought back some negative feelings. I went to bed last night not liking myself at all. Yesterday's Tricycle's Daily Dharma email (see below) talked about the awareness and acceptance. BB was right when he said that my focus on awareness was simplistic. Acceptance is certainly what one also needs to do as they look in the mirror. I heard today about a tribe where the fathers would say "become who you are." What a great way to nurture, as opposed to those that wish to "make people." 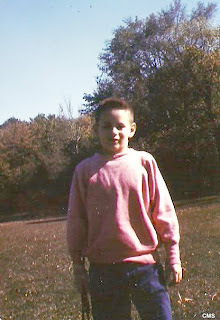 In the sixth grade (and long afterward) I wanted to become who my parents wished me to be. Not only did I not especially like that person, but it was not, for me, an achievable goal. They would often talk about others who would have been a perfect son. I only am me. Mindfulness practice—a profound method for engaging life’s unpleasant moments—is a powerful tool for removing obstacles and rediscovering happiness in relationships. Mindfulness involves both awareness and acceptance of present experience. Some psychologists, among them Tara Brach and Marsha Linehan, talk about radical acceptance—radical meaning “root”—to emphasize our deep, innate capacity to embrace both negative and positive emotions. Acceptance in this context does not mean tolerating or condoning abusive behavior. Rather, acceptance often means fully acknowledging just how much pain we may be feeling at a given moment, which inevitably leads to greater empowerment and creative change. - Christopher K. Germer from "Getting Along" (Spring 2006) Read the complete article. "I went to bed last night not liking myself at all." Your friend gives you permission to like you. I like you a lot,just about everything about you. H.
Food for thought (but you do look cute! ).